Chapter 4.2. Syntax: How is EXTIF pro.ini structured? 4.2. Syntax: How is EXTIF pro.ini structured? However, if the value of variable is not a character string, then the variable value must not be written between quotation marks. Section name and variable name must neither contain blanks (" "), nor equal signs ("="). At the right hand side of the equal sign ("="), which generally indicates assignment, there must not be blanks (" "). Nevertheless, at the left hand side of the equal sign ("="), there can be one, several or no blanks (" "). Relative geometrical distances - recognizable by the suffix "Rel" in variable names - are always indicated in percent and in positive values. indicates that the register cross - regardless of paper format - should always stand in the middle (50% of length of short side) of the crop margins of the paper format. On its Property Pages, EXTIF pro offers you the possibility to select whether you want to print the imaginary paper, the drawing canvas, in Portrait or Landscape orientation. For this reason, position indications in x- and y-coordinates, or horizontal and vertical coordinates, would be unusable without determining Landscape or Portrait orientation. That is why in EXTIF pro.ini you will often meet the terms "ShortSide" and "LongSide". These coordinates designate the short and the long side of a paper format - e.g. an A4 paper format has a short side of 21 cm and a long side of 29,7 cm. Regardless whether you turn the paper in Portrait or Landscape orientation, the short side always remains the short side, and the long side always remains the long side. 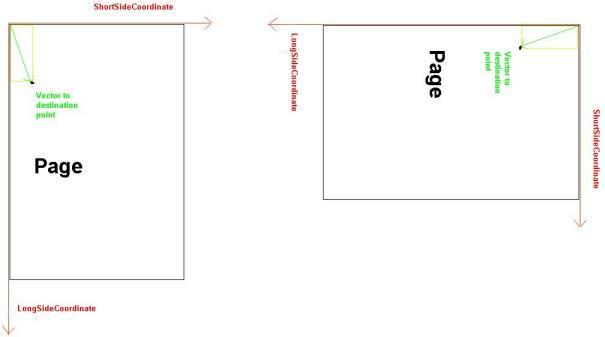 Rotation invariant ShortSide and LongSide coordinates determine distances along these two sides of the paper format.